I am a senior citizen, but I am not eligible for any of the above benefits. I have been scanning the papers to see what goodies are in store for senior citizens in the Budget 2013 speech delivered by the PM yesterday. Sad to say, the PM has let the warga emas down again. Mainly for the lower income group. Nothing much here to help the middle income group meet the rising cost of healthcare and medicine. Sure, there is something for everyone, as the PM has promised. But that 'something' is almost next to nothing for senior citizens in the middle income group. If you did not work in the civil service or serve in the armed forces, you don't get to enjoy the perks regularly handed out to pensioners. If you are not on welfare, the six additional centres for senior citizens will not benefit you. 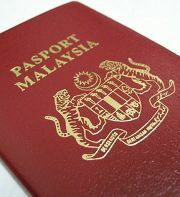 The processing fee for a 5-year passport has been reduced from RM300 to RM150 for those aged 60 and above. Only those still able to travel will benefit from this. It effectively rules out the older elderly. I just renewed my passport and will have to wait another five years to enjoy this 50% discount. Still, this is welcome news. We have to be grateful for any crumbs that fall onto our plate. Our silver-haired PM will turn 60 next year. Our former PM Dr Mahathir is already 87 years old. He should be championing the cause of senior citizens. Our biggest concerns have been, and will continue to be the rising cost of living and of healthcare. Sure, there is the BR1M (Bantuan Rakyat 1malaysia) of a one-off RM500 handout to help the needy including senior citizens. But you have to apply for it, and there's no guarantee you will get it. It's not for the middle income group anyway. Senior citizens, especially the baby boomers from the middle class, need more financial assistance. With longer life expectancy up to 76 years, they need to have enough savings to see them through their retirement. Many can't afford to retire, but they face age discrimination when they seek re-employment. 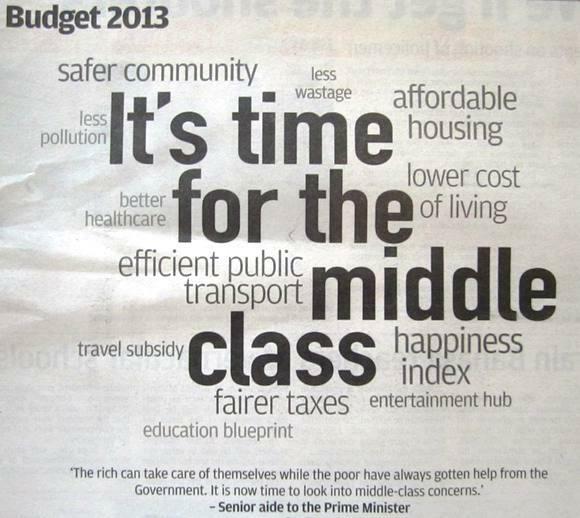 Why am I speaking up for the middle income group? Just because we are retired professionals, it doesn't mean we are financially comfortable, and don't require any government assistance. We are the middle income group that is literally caught in the middle, when it comes to financial commitments. 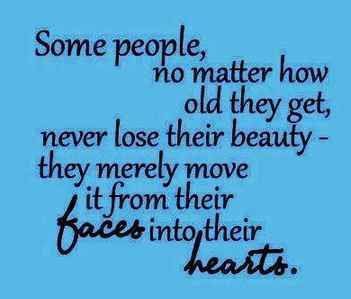 We have elderly parents to care for, and adult children to support. We are the sandwich generation. 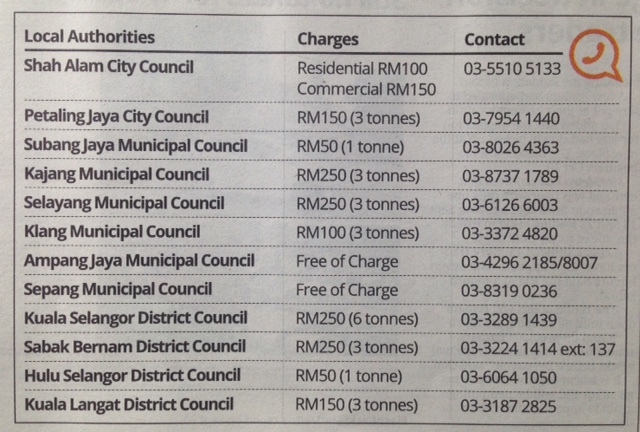 Heathcare and medical costs for our elderly parents can run up to tens of thousands of ringgit. As for our adult children, many are still not financially independent. They are either pursuing post-graduate degrees, or have housing loans, car loans and credit card debts to settle. Some need funds to start a business. Who do they turn to for interest-free 'loans'? Mommy and daddy, of course. So there goes our hard-earned retirement savings. While I can understand the need to help Felda settlers, fishermen, single moms, students, the disabled and even first-time house-buyers, I can't fathom the rationale behind giving PTPTN borrowers a 20% discount on their loan repayment. 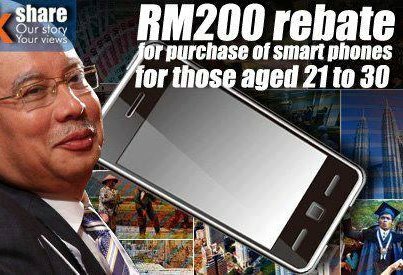 Neither can I accept any explanation for the RM200 rebate given to youths to purchase smart phones. I have to agree! I'm 51 years old. 2 of of kids are still in college and the youngest is still in primary. I'm currently jobless and I've been trying to look for a job but its hopeless really! 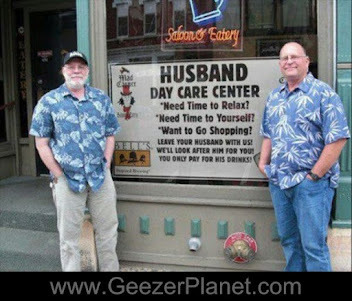 I do believe "age discrimination" is being practiced by employers. I've sold my house 3 years back to support my family. I'm now renting. Whatever little savings I have right now, can only last me for the next 3 months. 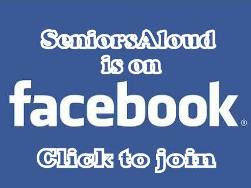 Please look out for job vacancies to be announced soon on SeniorsAloud Facebook page. The next few years will be more impactful on senior citizens. The endevour to make this country a high income nation will be bad news for retirees whose savings are derived from 20th century poor wage regime. Inflation esp food and housing will be rampant. Based on this many seniors will be driven to poverty. Many will have to sell their only home for their own and family upkeep. What will happen now when this money runs out? There is a very thin line between having a house and living in the streets as one of the homeless. As the street people of America have found out. When there is a down sizing in the employing market during hard times, many found that they cannot go on with mortgage payments and were kicked out of their houses. And in a country like ours where we are left to fend for ourselves without any safety net, it's a distinct possibility!!! Even now the population of street people who depend on charity run kitchens in this country are increasing. Our silver-haired PM will turn 60 next year. Our former PM Dr Mahathir is already 87 years old. He should be championing the cause of senior citizens????? May be if conscience got the better of Dr M!! like the subsidies and when he decided to implement the PPSMI (teaching and learning of maths and science in English) as his last 'benevelent' act before he stepped down when he realised the damage caused by his ever politicised education policy. The plights of salaried baby bloomer retirees today are the products of his policy of mediocrity, low cost labour and mismatch and depression of income vs actual costs of living (to attract foreign investments??). The average Malaysian salaried worker whether low or middle income have to spend about 50% of his salaries just to put a roof over our head and transpotation - a complete mismatch between income and basic necessity. One of the highest ratio between basic necessities vs income. Food and children's education take up the rest. How to save for retirement??? To Ah Jib Kor we are not his problem considering the National Policy for the Aged is a disgrace by itself!! A lot of wishful ideals to give the impression of a caring government but no affirmative actions!!! The Seniors who get nothing from 2013 Budget should know what to do at 13th GE : Hang them and vote for change,since our contributions are not appreciated ! Entitlements are welfare programs disguised as pension benefits. I have found recently that middle and higher income people are still crying to get handouts even though most of these entitlements are income tested. Instead of asking for more entitlements Seniors(50 plus) need to become more active, creative, and productive. How do we do that? More prosperous seniors now should be responsible for their own financial security in retirement. In this way they will also become a role model for the poorer seniors. Hopefully, there will be an increasing trend towards entrepreneurship where all seniors will benefit. This is the saddest part about the government, they don't care much about the seniors. They are the ones who need financial help since life expectancy becomes much longer. When this happens chances are they will need assistance which is very expensive in nature. You can't rely on the government alone so it's best to prepare while it's still early and you're still earning. You can consider applying for partnership long term care insurance while it's still early and you will find this beneficial in the future. HOW PREPARED ARE WE FOR AN AGEING SOCIETY? FORGET THE ZUMBA - LET'S DO THE GANGNAM!